We refer to Tom Kington’s article “Venice mayor mock tourists who were ripped off by waiters” (The Times 10 November). Once elected, a City Mayor is supposed to speak on behalf of the whole community and to channel a shared vision of its values, even more so when he has the privilege of speaking on behalf of a City with a worldwide reputation, such as Venice, and his words are therefore likely to reach an audience which goes beyond his village or borough. By labelling as “pezzente” (beggar, cheapstake, skinflint) a British citizen who had written a letter to him, and whose genuine concern was to preserve the reputation of Venice since he was not even seeking compensation, this mayor has in our opinion failed to behave in accordance with his duties, irrespective of the merits of the case – which should have been investigated rather than being dismissed in such a bullish way. By mocking a British citizen for not speaking Italian or Venetian, as if this could be an acceptable alibi for ripping off our visitors, this mayor may give the impression that this is common practice in Venice – which is not the case – and cannot speak in our name. We reluctantly take this initiative, while in our view it should be the mayor’s duty to preserve the reputation of a City which has been a prosperous and long lasting City State for eleven centuries and does not deserve to be treated like a parody of itself. Over the centuries, Venice like the Fenice Theater was able to come to new life and arise from the ashes of pandemics by hosting and trading with dozens of nationalities which are still reflected in the names of our streets. London and Venice have many things in common, in this respect, and we can hardly imagine the mayor of London treating foreign visitors the way our mayor did with these British tourists. Irrespective of the merits of the specific case, we Venetian citizens address our apologies to all British citizens for this lack of respect. It is ironic that the City Council has launched a campaign called “enjoy, respect Venice”. Our understanding is that respect should be mutual: those who request respect are more likely to receive it if they are able to offer the same in return. SELLING VENICE BY THE POUND, like the fish in that restaurant? 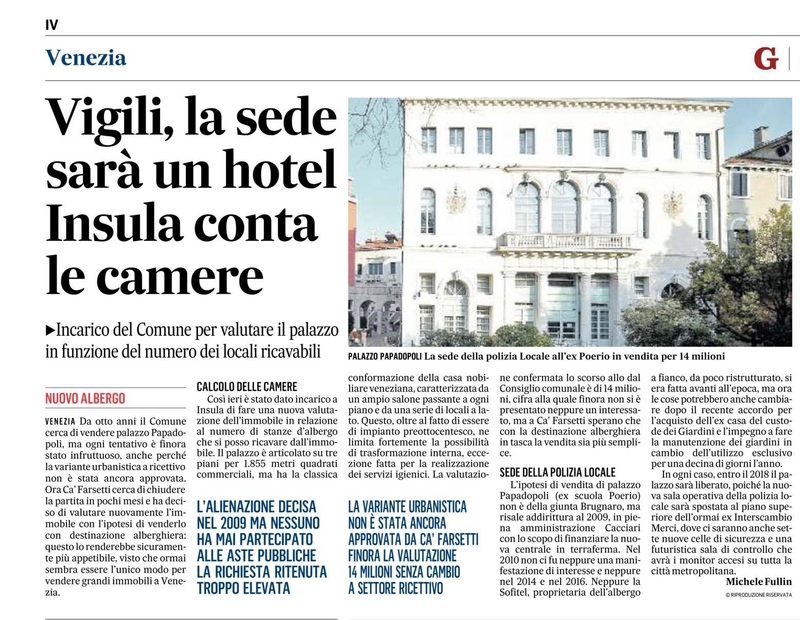 Incidentally, the City mayor who labels as “pezzente” the British citizen who paid more than 500 euro in a local restaurant (including a 12% “service” extra charge) is the same who is selling Venice by the pound: selling public buildings such as the headquarter of the local Police (Palazzo Papadopoli that is the former Poerio primary school), the Court of Appeal (Palazzo Corner Contarini) and the only building hosting social services in Venice (Palazzo Donà in Campo Santa Maria Formosa) while neither the economic circumstances nor the state of the City budget justify this systemic spoliation of common goods which are likely to be turned into Hotels for the profit of the few. “What news on the Rialto?” one of Shakespeare’s businessman characters asks another in “The Merchant of Venice”, referring to the bridge where Venice’s merchants met to trade. If such a scene were played out today, the topic of conversation might well be how money laundering and greed are undermining the very foundations of what used to be a prosperous, cosmopolitan and open minded State City, the third in Europe at the time when William Shakespeare was writing no less than three masterpieces inspired by the Venice Republic (Venice itself, Verona for Romeo and Juliet, and Cyprus for Othello). This process did not start with the current City Mayor, but “reversing the trend” was the main expectation of those who voted for him and disappointment in Venice is growing day after day, due to his failure to match those expectations, on top of the lack of judgment in his public statements. La lettera e’ molto bella. Adesso sotto con la preparazione della lista civica che speriamk potra’ vincere le prossime elezioni comunali. Magari prima di 3 anni..
sono ovviamente totalmente d’accordo con queste vostre considerazioni, fra l’altro ottimamente formulate. Tuttavia, sia in questo caso che in altri dove i comportamento di luigi Brugnaro si rivela al di sotto di ogni tollerabile limite, penso alla responsabilità di aver eletto un simile personaggio a sindaco di Venezia. A seguito di una pur incomprensibile scelta dell’ultimo minuto del sen Casson, il vostro movimento ha invece tolto il suo appoggio al sen.Casson, contribuendo, anche se non so se in modo determinante, alla vittoria di Brugnaro. da cui discendono le attuali orride conseguenze generali e particolari . Vorrei che queste considerazioni servissero al vostro ottimo e meritori movimento come lezione per le prossime elezioni comunali.